LLUIS FUZZHOUND: Can't Slow down! Sorry I haven't been posting stuff in awhile been pretty busy I'll have some stuff to show soon, All of a sudden just gotten crazy busy around these parts, so yeah I'll post some stuff soon!!! 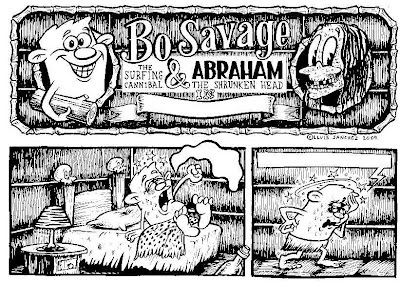 Well these bottom drawing I took into Zak Surfboards in Thornbury and he really liked them so I'm doing some other stuff I've been busy on , I'll show you when I have it all finished, The bottom drawing is the beginning of a small Bo Savage comic I'm working on, ohhh I'm having such a good time!!! hehehehehe!!!!! I'm also working on the new Kustom Lane exhibition poster.... THE ATOMIC AGE!!!! will have this ready next week some time, and also working on Serafin animation.... if you click on the Image up the top it's GIF that will walk n stuff, so yeah enjoy and see ya soon!